July 11, 2015 – It’s Antarctic winter on Pluto. The sun has not been visible for twenty years in this frigid south polar region; it will not shine again for another 80 years. The only source of natural light is starlight and moonlight from Pluto’s largest moon, Charon. 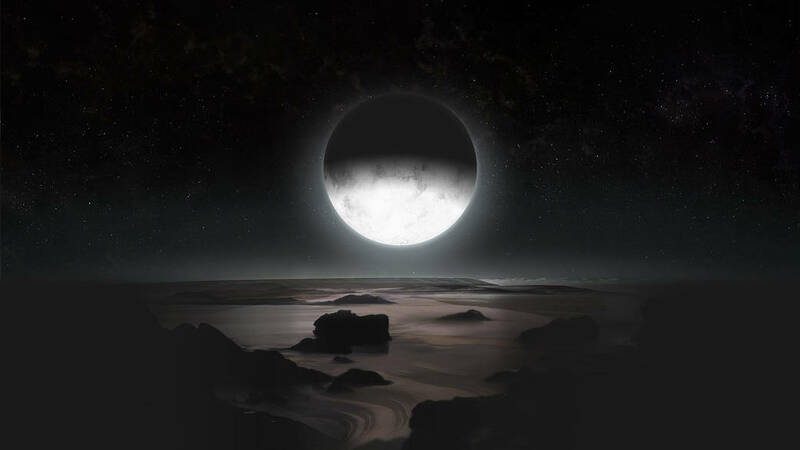 On July 14, New Horizons mission scientists will soon obtain the first images of the night region of Pluto, using only the light from Charon, itself softly illuminated by a Sun 1,000 times dimmer than it is at Earth. The images will provide New Horizons’ only view of Pluto’s lesser-known south polar region, currently in the midst of a numbingly-long winter. The pictures will be made with the LORRI and the Ball Aerospace-built Ralph instruments, shortly after New Horizons passes its point of closest approach to Pluto. If you stood on the night region of Pluto at that moment of closest approach by New Horizons – looking up at a distinctly gray Charon – it would appear seven times larger in the sky than Earth’s moon. Charon, although three billion miles from the sun, is so close to Pluto and so ice-covered that it would be only five times dimmer than the full moon seen from Earth. At your feet, the icy surface – resembling a sooty snow bank – would be bathed in Charon’s faint glow. The area around you would be dim, but not so dark that you would bump into things. On your moonlight stroll on Pluto you’d notice that your shadow, cast by Charon, is much less defined than your shadow from moonlight on Earth. A wisp of cloud might even pass in front of Charon as you look up. If you stood on Pluto’s Charon-facing side as New Horizons speeds by, you would see Charon go through a cycle of phases during a “Pluto Day” – 6 days and 10 hours—but not the complete set of phases our moon displays to us on Earth. Seen from Pluto during that time, Charon would go from a wide crescent, to a “quarter moon,” then to gibbous (partway between quarter and full phases), and back again. New Horizons has been traveling for nine-and-a-half-years to bring humankind its first exploration of the Pluto system. While the sunlit features of Pluto are growing sharper every day, the shadowy winter region is still cloaked in mystery—but not for long. NASA’s unmanned New Horizons spacecraft is closing in on the Pluto system after a more than nine-year, three-billion-mile journey. At 7:49 AM EDT on July 14 it will zip past Pluto at 30,800 miles per hour (49,600 kilometers per hour), with a suite of seven science instruments busily gathering data. The mission will complete the initial reconnaissance of the solar system with the first-ever look at the icy dwarf planet.